The pH level in a saltwater aquarium is a constant concern to most marine aquarists. Whereas the occupants in a fish-only system can tolerate a fairly wide range of pH levels for periods of time with no major harm, the occupants of a reef tank, which includes both fish and invertebrates, rely heavily on a constant pH level in the right range just to survive, let alone thrive. The accepted pH level in a basic saltwater system is between 7.6 and 8.4, but reef tanks are more sensitive, and therefore need to be kept at the higher end of the pH scale, 8.0 to 8.4. To control or adjust pH, one must first understand what it is. Although understanding the chemistry of how ions interact can be complicated, developing a layman's understanding of pH is not hard. pH (power of Hydrogen) is simply a measurement of the acidity or alkalinity of any solution. A pH of 7 is considered to be "neutral," neither acid or alkaline, while pH above 7 is alkaline or "base," and below 7 is acidic. Of course, respiration and metabolic wastes are a natural part of the ocean. However, the reason that seawater pH does not change is that the water contains a number of chemicals, such as bicarbonate, calcium, carbonate, borate, and hydroxide, all of which act as natural "buffers" that retard the drop in pH. So where does alkalinity come into all of this? The degree to which a solution maintains its pH when acid is added is termed the "alkalinity" of the solution. Related terms used in reference to aquariums are carbonate or calcium hardness, and its German equivalent, KH or dKH. The amount of "buffers" in seawater determines the alkalinity. When the pH in a saltwater system starts to drop, it is an indication that the buffers are getting worn out, and it indicates that the increase in acidity needs to be corrected. To raise pH, easy methods are to add bicarbonate of soda (baking soda), or a commercial pH adjustment product. To lower a high pH, quick fix remedies are to add some vinegar or lemon juice, or a commercial pH reduction product. For stabilizing pH, the generally accepted "tried and true" method is still performing regular partial water changes. This not only refreshes the natural buffers but also restores the trace minerals in the aquarium's water. Of course, reducing the causes of the drop in pH is always wise. Removing all uneaten foods and fish waste from the tank on a regular basis will go a long way toward retarding a drop in pH. Use a simple doser to automatically add buffers as well as calcium, iodine, other essential trace elements, and supplements. Installing a calcium reactor, although a more expensive option, can provide a no-hassle solution to control radical pH and alkalinity problems. Keep in mind that any major adjustments in the pH level in your tank should be done slowly. 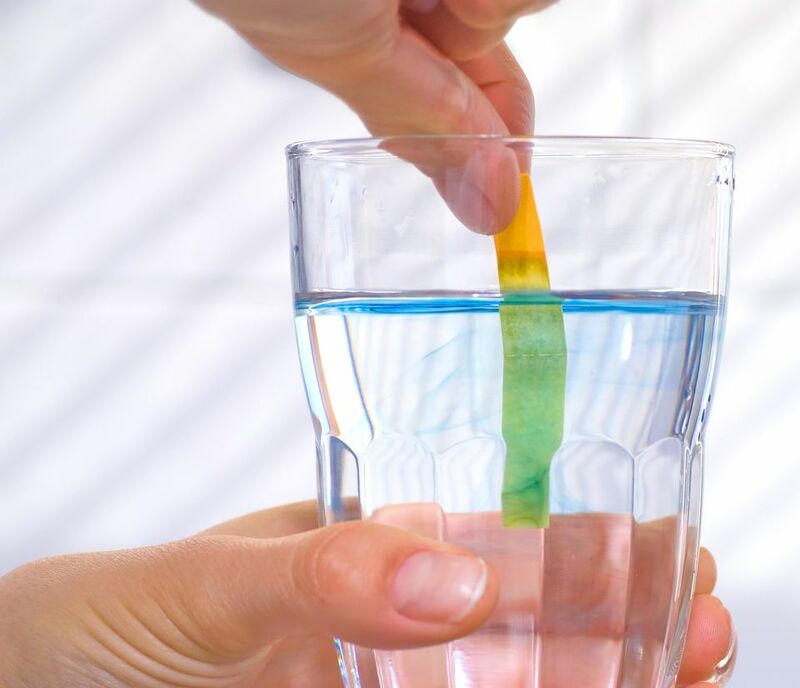 Raising the pH from 7.4 to 8.4 in a matter of a few minutes can induce pH shock in almost any saltwater fish (and invertebrates), causing death. If you are making major adjustments, do it slowly, as you would when acclimating new arrivals to your tank. Saltwater, without outside influences, will maintain a steady pH. If this is so, why does the pH in your saltwater aquarium change, usually dropping lower? In most cases, the pH drop is due to the acid produced by the production and reduction of ammonia. The ammonia is created by the livestock in the tank as it eats food and produces waste (mostly detritus) which then decomposes. Uneaten food on the bottom of the tank also produces ammonia as it decomposes. The same is true with any dead critters that are left in the tank. A regular tank maintenance program that removes fish waste and uneaten food, along with partial water changes with new saltwater, will usually keep the pH in your aquarium at the proper level and make pH adjustments a thing of the past.